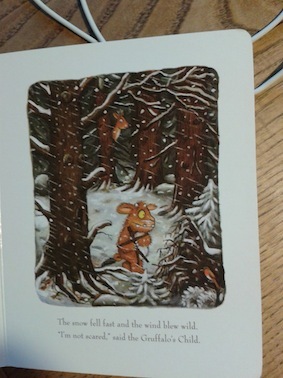 A beast that resembles a roe deer makes a brief, non-speaking appearance in The Gruffalo’s Child, but of the deer resident in Britain, they are probably the hardest to see – and that’s despite being common as muck and found virtually the length and breadth of the country. Trouble is, they don’t gather in herds like fallow and red deer and they live, almost exclusively, in woodland. Generally speaking, encounters with them are chance encounters, which isn’t ideal for kids. I have other deer adventures planned for later in the year – in particular, a trip to see the sika deer rut in later October, which is supposed to be very exciting – but coming back from dropping off Sam (5) at school, Mungo (going on 3) and I had a brief but interesting sighting of a solitary roe deer, thus neatly ticking off the correct species in our ‘Gruffalo’ quest. We had just dropped into the dip that separates the south and north parts of our village – or the demilitiarised zone dividing the free south from the communist north as some people like to call it – when I spotted her. Just something strange amid the less than lushly green grass at first. Then I realised – there was a chestnut brown face and two black eyes staring intently back at us. Diverting Mungo’s attention from the sound of an emergency services siren in the far distance, I picked him up and and pointed in her direction. “Roe deer, roe deer,” I said, hoping the tone of my voice would suggest that this was almost as exciting as an Intercity 125 hurtling through Stroud station. Of course, he couldn’t see it. She was remarkably well camouflaged, and I think she knew it. Just stay still, she was thinking to herself, and that stupid kid with the red train and its tender clutched in his fists won’t have a hope. I don’t know whether it was the old lady coming down the hill (from the free south) that spooked her, but suddenly she was up and off, trotting elegantly and calmly up the hill. “Roe deer, roe deer,” I said again. “Dere, dere,” said Mungo, following the arc of her progress round a small clump of trees with a stubby finger. She came out the other side and carried on up the hill, now running quite fast and free. “Robot, robot,” Mungo seemed to say. He hasn’t quite mastered the power of speech yet, but he’s getting there. At this point, the old lady arrived. “What was all that excitement about?” she asked. 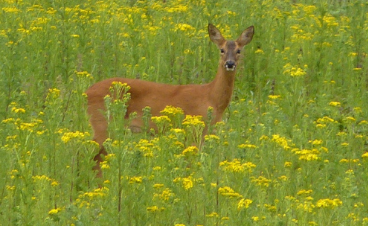 “It was a roe deer,” I said. The old lady didn’t quite ‘harrumph’ but she might as well have done. Oh, roe deer not good enough for you, I thought. “Well, it’s nice for kids,” I said, thinking, what does she want – the entire 1.5 million wildebeest population of the Serengeti to come charging through our village every Friday morning? “Not so nice for gardens,” she replied curtly. I wondered for a second whether she was being entirely serious, but when I realised she was, I simply said, “Well, they live here, too,” and bidding her good day, we went on our way. “Yeah, your dad shooting rabbits with his shotgun just for nibbling a bit of lawn” she laughed. 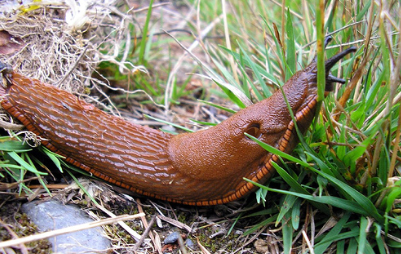 A short distance up the path from where we said goodbye to the old lady, I spotted a large brown slug crossing our route and pointed it out to Mungo. “Slu,” he repeated delightedly, and immediately started to stroke its slimy brown saddle. “Slu.” Well, that gives me hope at any rate.